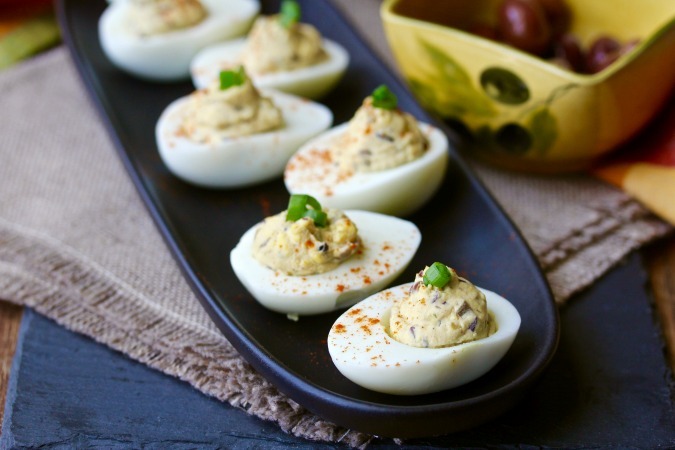 These Olive Tapenade Deviled Eggs are one of my favorite ways to enjoy hard boiled eggs. Deviled Eggs were probably my first official introduction to appetizers. In my family, someone always brought a tray for Christmas Eve dinner every year. The trouble with deviled eggs is that you could pretty much ruin your dinner because they are so delicious. We usually keep a small bowl of hard boiled eggs in the refrigerator, and I've actually used them to whip up some deviled eggs for breakfast. I'm a firm believer in using my available calories for my cravings, and when I crave deviled eggs, why waste the calories on scrambled eggs? There are so many ways you can make deviled eggs beyond the traditional yolk, mayo, and mustard mixture. 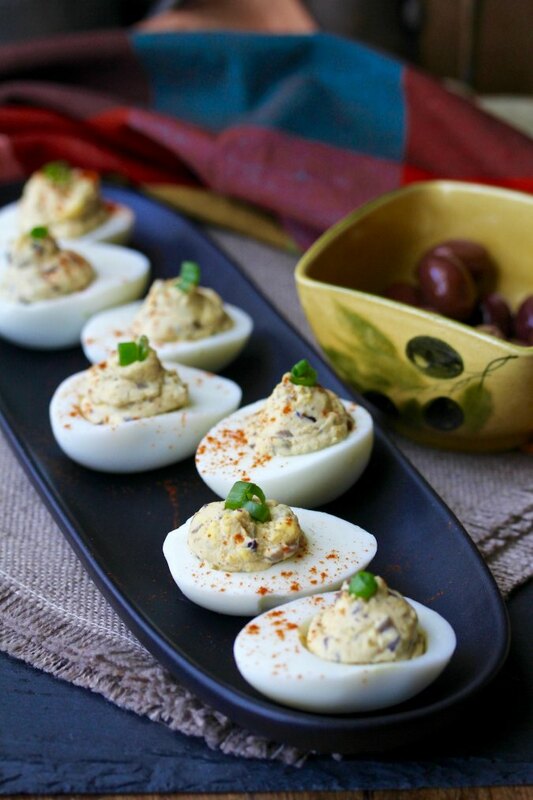 This take on deviled eggs includes a generous helping of olive tapenade, another one of my favorite appetizers. The saltiness of the tapenade and the creaminess of the egg yolks combine to make a delicious party staple even better. For more delicious deviled egg recipes, be sure to check out the links in my Smoked Trout Deviled Eggs post. These deviled eggs are inspired by the book, Mark Bittman's Kitchen Matrix: More than 700 Simple Recipes and Techniques to Mix and Match for Endless Possibilities. Three of us are spending a year cooking our way through the book. After the recipe, be sure to check out what my fellow Matrix buddies, Camilla and Wendy, made this week from the section called Hard-Boiled Eggs +12 ways. In the book, there are recipes for pickled eggs, deviled eggs, eggs simmered in tomato sauce, and egg salad. I took the recipe for classic deviled eggs and added some dry mustard and a generous spoonful of my favorite olive tapenade. Place six eggs on the bottom of a 4 quart sauce pan and cover them with water by one inch. Bring the pan to a boil, and then let it simmer for one minute. Cover the pan, and turn off the heat, and set the timer for 12 minutes (Mark Bittman says 9 minutes, but 12 minutes works perfectly for me). After 12 minutes, place the eggs into ice water and let them cool for a couple of minutes. Gently tap the egg shells on the counter and place the eggs back in the cold water for about five minutes. At this point, the shells should peel off easily. 1 heaping tablespoon (or more to taste) store bought or homemade olive tapenade from this recipe. Peel and slice the eggs in half, lengthwise. Place the yolks into a bowl and mash with a fork. Add the mayonnaise, mustards, and cayenne pepper, and mix until smooth. Add the tapenade and salt and pepper and stir until thoroughly combined. Place the yolk mixture into a piping bag and pipe into the egg white cavities. Garnish with paprika and an olive or scallion slice and chill until ready to serve. I have to laugh at all the different ways everyone has to hard cook eggs LOL. I boil mine for 3-4 minutes and then let them sit in the hot water until it cools. 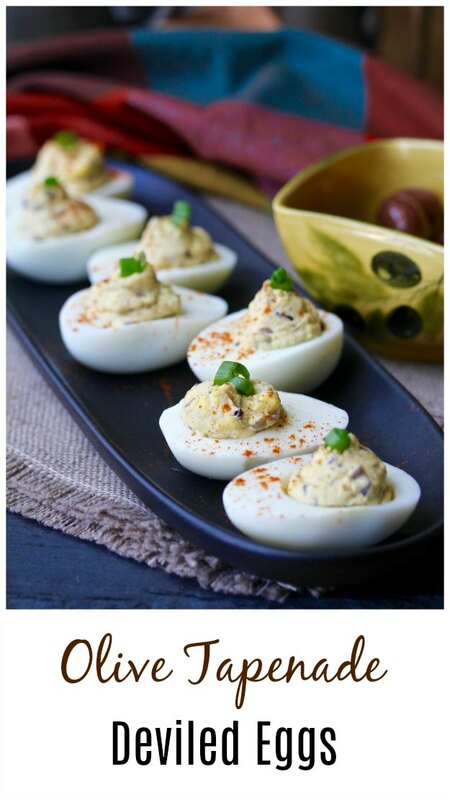 Love the idea of adding olive tapenade to the deviled eggs. It is funny isn't it? I used to simmer them for 10 minutes and always ended up with green tinged yolks. I hear doing it in the Instant Pot is all the rage too. Seems like too much trouble to me! I love deviled eggs and, like you, can definitely ruin my dinner with them. Haha. I love this recipe, too. I made the Rustic Eggs as well and will post that eventually, but I need to re-do my photos. They weren't very good. no other outcome possible - I am making this very very soon! what a great twist on a classic, Karen!